With everything happening in my life lately, I have found the need to simplify so many things - including my purse. I had originally purchased a larger purse, which meant I needed to fill it. I failed so miserably. So I went back to my traditional small purse. And you know what? I have all of the perfect things to fill it! One of which is the Macaron for Hair from Milk+Sass. 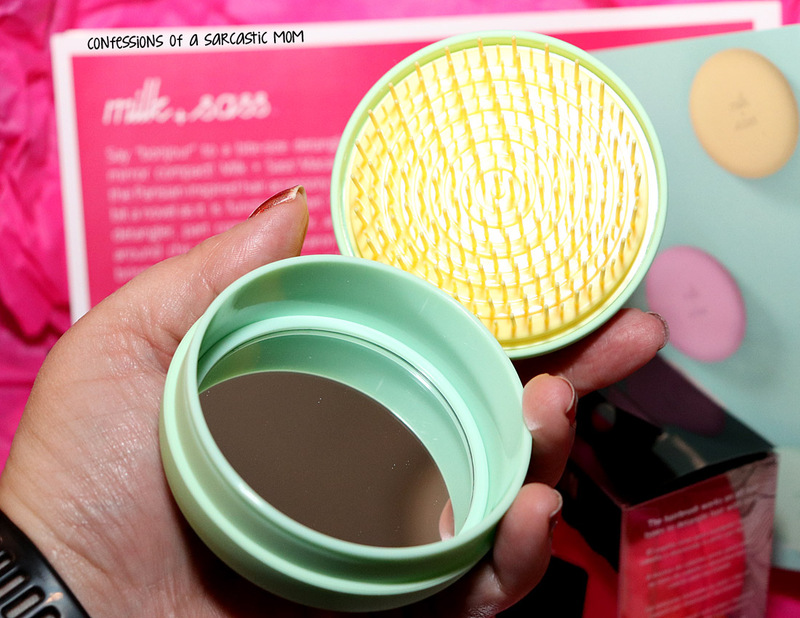 These cuter than cute little macaron-shaped brushes are the perfect compact! I have been carrying one around in my purse for weeks now, and I pretty much use it every day. As I've gotten older, my hair has taken on a mind of its own. It's grown increasingly wiry (as I get grey hairs - don't judge! ), so I'm constantly dealing with little snarls and tangles. Having this brush available in my purse has saved me! In my new job, I have to appear "put together" at all times, which is a new concept for me, having stayed home with my son for 9 years. I have meetings I must attend, and sometimes, those meetings happen toward the end of the day when my hair is at its worst. But now I don't have to worry! 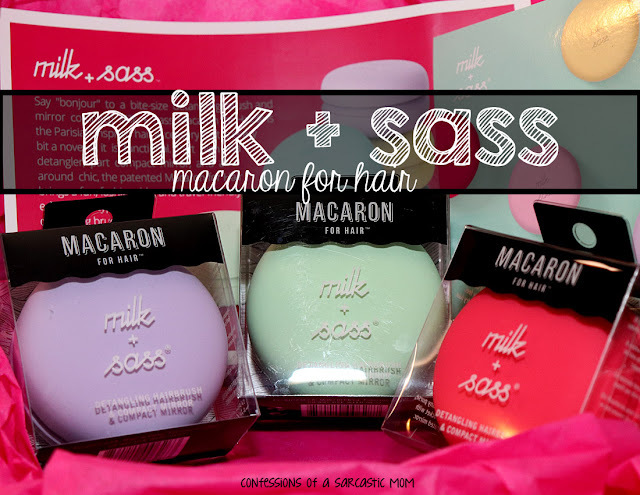 I know I can pop my Macaron out of my purse and smooth my tossled hair, making me meeting ready! Say “Bonjour” to the bite-sized detangling brush making a massive impact! 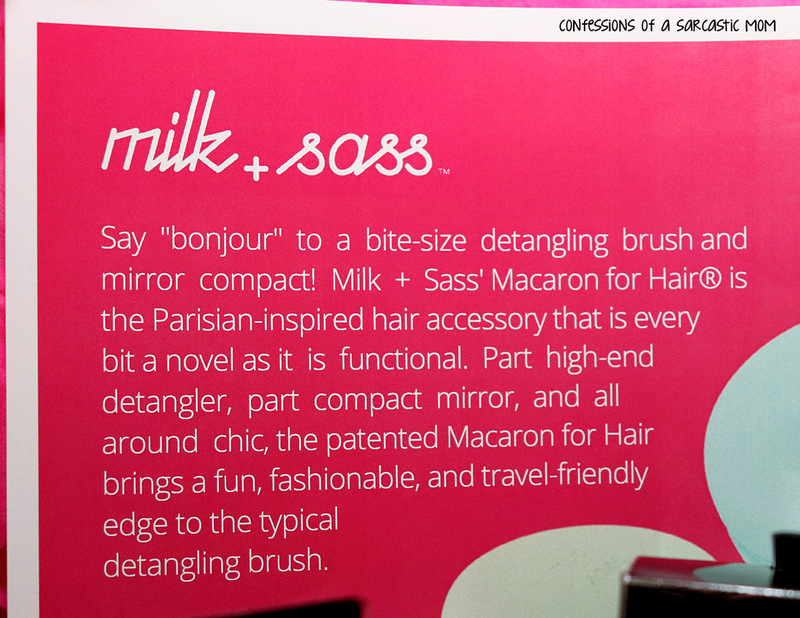 The Macaron for Hair® is a sweet and petite Parisian-inspired detangling brush that smooths tangles in half the time of conventional brushes. The pop-on/pop-off cover works double time as a bristle protector and compact mirror—perfect for travel and on-the-go styling! Strategically sturdy radial bristles are combined with a lightweight ergonomic design for optimum comfort, control, and tangle taming for every hair age, type, and texture. Simple to use! You just pull the two pieces apart. One side is a squishy detangling brush, and the other side is a mirror, which I use pretty much on the regular to check my lipstick and shine. So convenient to just pop open the Macaron while sitting at my desk and not have to walk down the hall to use the mirrors in the restroom. 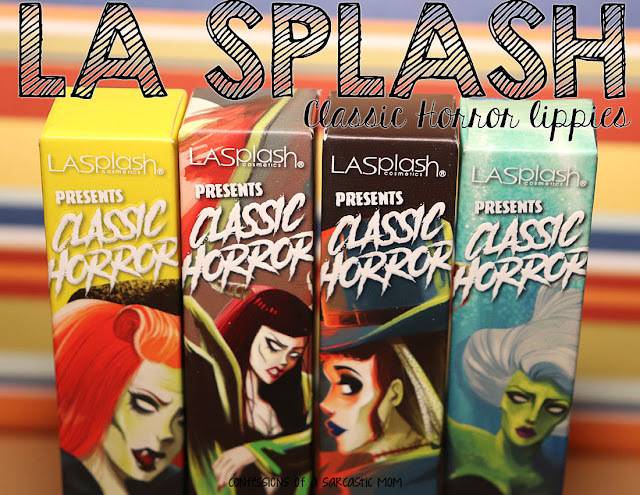 Available in six different flavors to suit every personality. Raspberry, Black Licorice Framboise, Mint Citron, Lemon Pistachio, Rose Petal, and Lavender. 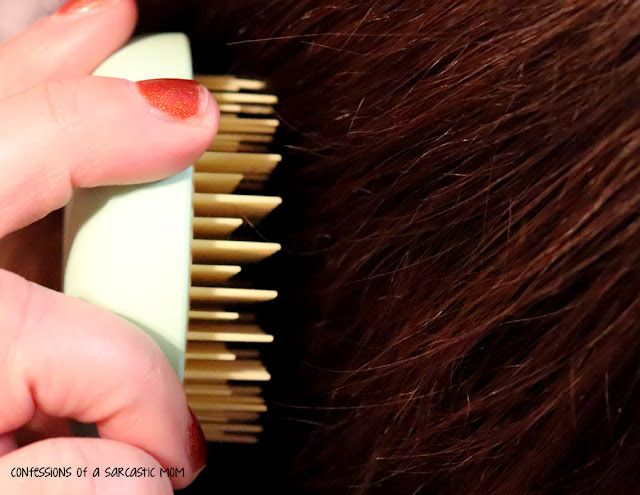 These bristles are so soft and movable... they even give an ideal head massage! But most of all, they are so gentle that I never have any pulling or tugging - and sometimes my hair gets some nice, big tangles. Since beginning use of the Macaron for hair, my hair has been smoother and more manageable all day long at work. Price point on these is $12.99 for most colors, but the gold color is $15.00. I definitely recommend these for everyone! They would be super cute for all ages, even right down to toddlers! I know my nieces have loved using mine.